It beeps, rolls, teaches and reads, but Beepbot is much more than a toy. The Guelph Public Library’s new robot is a hit with visitors. Kids gather around for story time to listen to the robotic fellow. “He’s just another way to get kids interacting with one another and to get excited about reading with their friends,” explains Meg Forestell-Page, the programming supervisor. 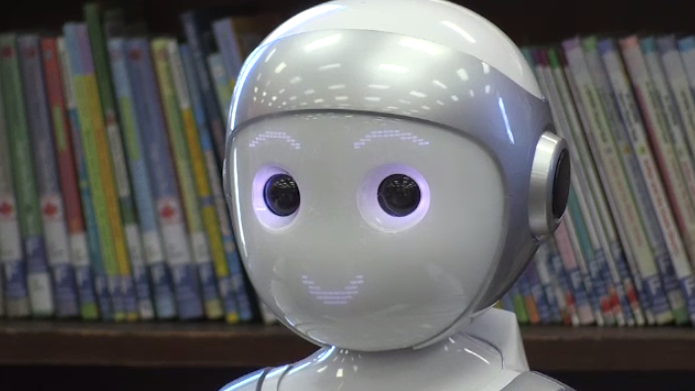 The library bought the robot in 2018 for about $3,200 from the library's budget. It went into service in March, aiming to bridge the digital divide and promote literacy and social skills. Parents seem to be in favour of the new addition to the library. “I think it’s a fascinating way to integrate a form of technology into a really traditional form of storytelling,” says Kevin Page. He says his son was able to get close to the robot, able to talk to it and shake its hand. The machine also plays games and serves as an introduction to little ones. “We also have pre-teens and teens interacting with him because he does teach coding skills,” Forestell-Page says. About 80 people came out to see the robot for its debut. Beepbot lives at the main branch of the Guelph library, but there are plans to have it visit other branches and make appearances at outreach events. Beepbot helps kids get excited about reading.